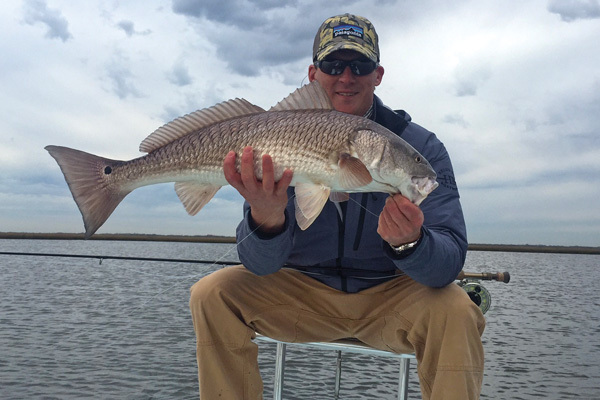 Torrey Hawkins, owner of Bayou City Angler with a nice early spring red. The upper Texas Coast typically falls into its spring time pattern by mid-to-late February. This year will certainly not be an exception to the rule after a very mild winter and rapidly warming daytime temperatures. Unfortunately, spring patterns are probably the most difficult to sort out. Fish are transient, temperature swings are frequent, and food sources change on nearly a daily basis. The easiest transition to see and understand is that of the temperatures, both air and water. There are a couple of fun things to note about the changing temperatures. First, it helps to understand the two basic rules of air and water temperature and how they affect fish and their food sources. The relationship is much like that of a large heat exchanger or radiator. Typically, the water is somewhat constant and much slower to change, while the air temperature is almost constantly changing. Here’s where it gets fun; if the air temperature is colder than the water temperature, then the surface water will cool most rapidly. In this scenario, shallow water will cool down much faster than deeper water. If this change is significant enough to cause discomfort in fish or their prey species, they will begin to move to deeper water. Let’s flip the equation: now the air temperature is warmer than the water and increasing. In this scenario, shallow water and surface temperatures will be on the rise and, following in suit, the fish and their prey will be moving toward shallower water. Clearly, you can see how this knowledge will benefit you in narrowing your search for fish. Keep in mind that this is all relative. Shallower or deeper is relative to current depth, warmer and colder being relative to current temperatures. There are some limits to when this information is useful. Once water temperatures and air temperatures stabilize above 65 degrees Fahrenheit, warming temperatures are not nearly so relevant. Most of the common predator and prey species are well within their comfort range so we need to be more aware of a cooling event at that point than we do of a warming event. 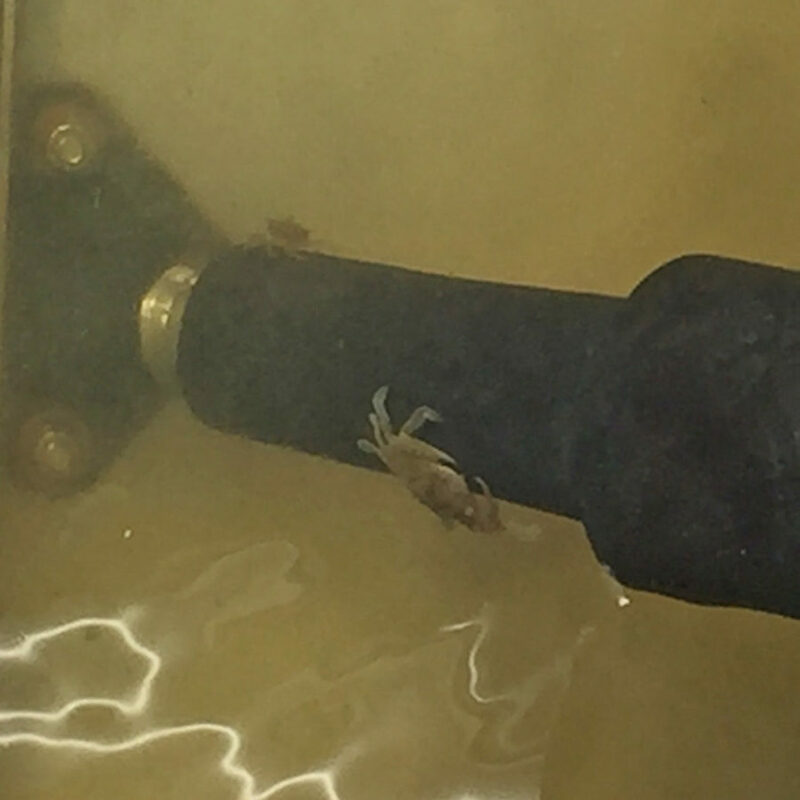 Juvenile crabs start becoming more prevalent as spring returns to the Texas coast. There is a large food source transition that happens typically starting in late February. Through most of the winter months, predatory fish in the bays are limited in the overall variety of food sources. As the daytime photo period becomes longer and temperatures gradually start to trend upward, we see an increase in the number and availability of prey. Most are the smaller of their respective species, but it’s important to know that overall availability of food has increased. These sources come in from the warmer gulf waters or have descended from rivers and creeks, or even emerged from the mud where they took shelter during the winter. We can draw a few conclusions from this knowledge. Food on average is much more prevalent. Early in spring, the average size of food sources is typically much smaller than what was available through the winter months. Last year, I wrote about some of the species that become prevalent again in spring. Shad, shrimp, glass minnows, worms, eels, crabs and more start to make a showing. In the winter months we could do well just imitating a mullet or an eel, but in spring it can often be much more difficult to entice a bite from finicky fish. Many of the newly available food sources are not easy to see and therefore not easy to emulate. Some simple ideas that can help; due to increased populations, predators aren’t always so quick to jump on every passing opportunity. It is a safe expectation that numerous small meals are within reach and often easier to take advantage of than the single, larger meal. Keeping this in mind, it makes sense to scale down the size of the offering and this often leads to a greater number of bites. Downsize to smaller baits like the MirrOdine Mini in spring to mimic the easy meals predator fish are feeding on, like shad and glass minnows. So, we know that our predator fish are moving much more in spring due to availability of new food sources, changes in temperature and movements of their food sources. We also know that if the air is warmer than the water, shallow water will warm faster and conversely, deeper water will offer greater comfort in cooling periods. Mud, especially dark colored mud and areas of deeper mud, tend to retain much more heat than areas with sand or light colored bay bottom. Understanding that last thought, brings light to an interesting spring pattern. This will be disappointing to many anglers as it doesn’t fit the “dawn patrol” profile. Wendell Breazelle with a big 27.75” trout. Warm spring days with abundant sunshine tend to warm soft mud areas. This may not always draw predator and prey populations during daylight hours, but the heat retaining properties of soft mud and shallow water create a comfort zone for overnight dwelling. In so many areas around the Galveston Bay complex you can watch this take place. As the sun draws lower in the sky, and the temperatures start to drop, baitfish swarm the shallows. Comfort and abundant plant food sources draw them in, followed closely by their predatory brothers and sisters. Pulling all of this together, be aware of both air and water temperatures and the relationship of change. Be prepared to scale down the size of your offering and perhaps most important, don’t get too hung up on being the first boat on the bay. Some of the best spring time bites I have ever experienced were much closer to sunset than sunrise. Many of those days were not really days, but more like evenings or even nights of fishing. There was a time when I would schedule guided trips from February through early April to all continue until at least sunset, if not later. That way we could be there when the fish were most concentrated and active. There is no guarantee anywhere in fishing, but narrowing the field, so to speak, can only add to our odds. 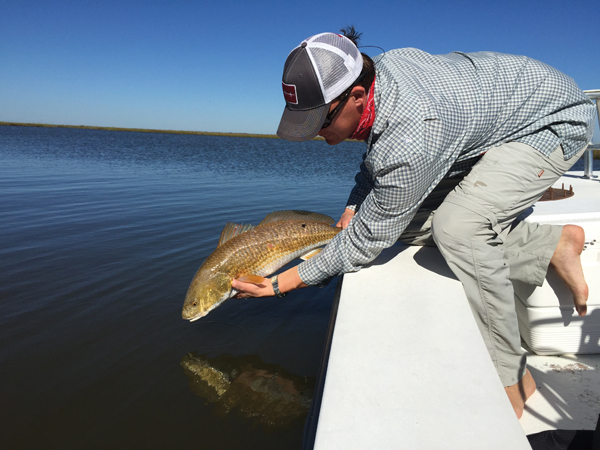 Torrey Hawkins releases a 29-inch marsh red. Spring on the upper Texas Coast brings the return of many things, sunshine and warming temperatures are what we tend to notice the most. As much as those two factors make us rush to the bays, they are not the keys to angling success in the Spring. Though they do in fact play an important role, they are not nearly as influential as most anglers believe them to be. 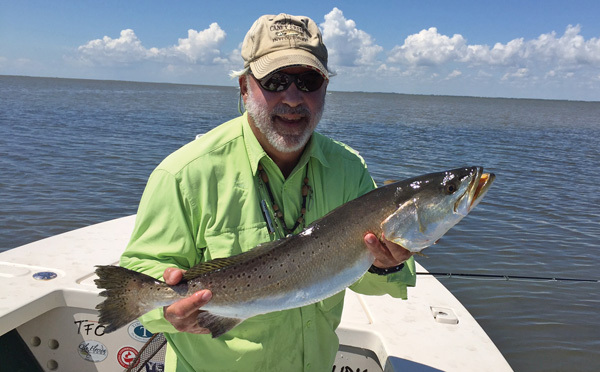 Conditions, specifically those that we can easily detect above the water, are not the same as those that a predator like a redfish or speckled trout feels below the water’s surface. If I was to give my personal estimation of the two conditional factors that have the greatest influence, they would have to be water temperature and daily photo period. These are what both predator and prey feel, and are the factors that drive spawning and the return to shallow bays and estuarine waters. Beyond sun and rising water temps, wind is probably the most notable factor for anglers, and probably the one that is the most discouraging. We can’t change the wind and it isn’t always easy to forecast, but we should all understand its impact and learn to use it to our advantage. Strong southerly winds and powerful incoming tides of Spring are the arteries that deliver the life blood to our coastal bays and estuaries. These will typically start bringing new life as early as February, and continue well into April and even May. These bull tides bring numerous prey species, along with their food sources, back to the shallows. Each of the returning animals’ migration, whether large or small in distance, is timed perfectly by the return or resurgence of their primary food sources. An entire article could be dedicated to prey species, their eating habits and preferred habitat, but knowing a few factors that play critical roles in locating and catching trout and redfish are worthy of mention. Blue and stone crabs, white, brown and to a lesser degree, pink shrimp, glass minnows, menhaden and shad, as well as sheepshead minnows and many more all make their annual return to the estuaries during spring. They wash inshore on incoming tides towards lower salinity estuarine waters where they can thrive and find abundant microbial food sources. The Bass Assassin Sea Shad in Slammin’ Chicken is a good springtime marsh bait. Purple is a common color in juvenile blue crabs. The Norton Bull Minnow in Texas Roach is good for low visibility marsh water. Use 1/16-1/8 oz jigheads with these soft plastics. As anglers, we can all benefit from a greater understanding of the life cycles and influences within our chosen fishing grounds. Just as these animals arrive, due to abundance of food, so do their predators. In nature, every step of the food chain is driven by three basic, instinctual needs: food, safety, and reproduction. Knowing this makes it very clear that to find our target fish, we must find its target or preferred food. As anglers, we can all benefit from a greater understanding of the life cycles and influences within our chosen fishing grounds. We must accept that sometimes the things that frustrate us the most can provide the greatest advancement in our angling skills. Wind can make our fishing days challenging; knowing where those winds deposit concentrations of prey species can make them more productive. West Galveston Bay’s notorious winter “moss” can frustrate us to no end, but the realization that its “decay stage” provides possibly the largest food source for many returning and emerging prey species, might well make you look more closely at the areas most inundated. Knowing some of the favorite prey species and their preferred habitat and food sources are great. Now, it’s up to you as a successful angler to locate them. Most of these small species are difficult to physically locate. Thankfully, there are some larger and more widespread animals that can help us locate the smaller food sources that often lead to greater catches. Since most every angler reading this has likely experienced fishing an area devoid of prey species and the ensuing unproductive day, we probably all can now see the importance of finding the food source. Focus your efforts, whether on open bay shorelines, or in the marshes, on the areas populated by mullet. They are not only much easier to see, but they also eat the same decaying plant material that most of the smaller prey species dine on. Also, take the time to explore every stretch of water inhabited by shore birds such as egrets, herons, ibis and spoonbill. Areas where terns and gulls are diving are likely to have juvenile surface dwelling animals, riding currents. Many of these are extremely small and hard to see, but don’t think that hungry predators would pass up on the opportunity to feast on these helpless little morsels. 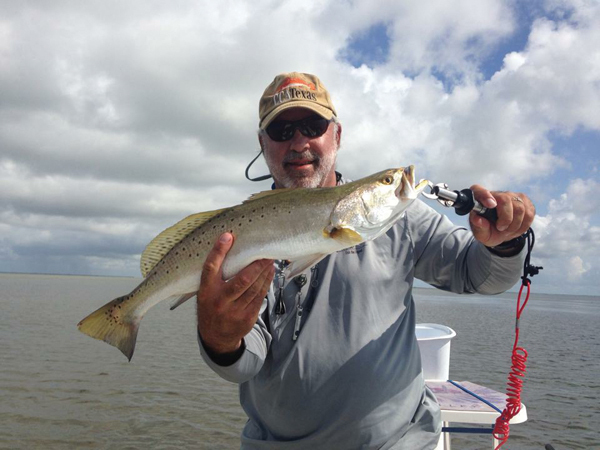 Wendell Breazele with a nice fly caught trout. Don’t let the most transitional season deter your efforts, use this season to explore and use your angling skills to locate fish in places you haven’t often looked. You will find, that even though spring fishing can be very challenging, it can also be very productive for those who armed with knowledge. You might just find some very aggressive fish that are waiting to reward you with explosive strikes.